Bed rails are metal bars used on the sides of beds to keep sleeping people from rolling out onto the floor. They’re most often used by parents of small children or families and caregivers of the elderly. While they may help prevent a rude awakening, they can also inflict injuries and death when a person becomes entrapped or strangled by the device. 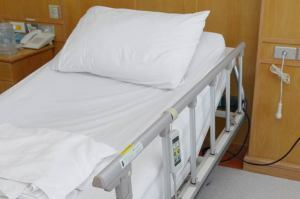 According to the Federal Drug Administration (FDA), there are about 2.5 million hospital and nursing home beds in use in the United States, many of which are equipped with bed rails, and hospital-type beds are also often used in residences where elderly patients receive home health care. Bed rails used in these situations are considered medical devices and are overseen by the FDA. The agency provides manufacturers of bed rails with guidance on the design of safe and effective hospital beds and bed rails and requires manufacturers to adhere to certain medical device regulations, such as the timely reporting to the FDA of problems associated with bedrails.